You may not think of CMT wen you're itching to watch something funny on television, but all that is about to change. 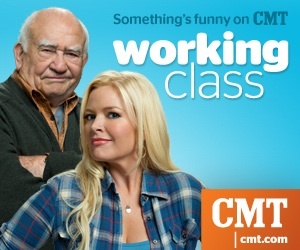 On January 28th, Country Music Television is premiering their first ever sitcom, Working Class. WORKING CLASS focuses on Carli Mitchell (Melissa Peterman), a single mom from a rough and tumble background, trying to give her kids a better life by moving them to an upscale suburb. She quickly finds that making the transition to “the good life” is harder than she thought. She's unwittingly befriended by her cranky neighbor, Hank (Ed Asner), her only “career” prospect is a glorified deli job at the local grocery store, and the man she falls for not only already has a girlfriend – but he’s also her boss, Rob (Patrick Fabian). With her ladies-man brother, Nick (Steve Kazee), to help her out (when he’s not acting like one of the kids himself), Carli faces the challenges of parenting, dating, and making friends in her new community by doing more with less, staying true to herself, and approaching each day with a touch of working class. WORKING CLASS premieres January 28 at 8:00 p.m., ET/PT on CMT. ReviewI was asked to watch and review the premier episode of Working Class, "The Buddy System." One of the first thing I picked up was the live-audience laughter that so many sitcoms of the past used to have (Friends, Home Improvement, etc.) A lot of networks are backing away from that these days, but I personally kind of enjoy it. It helps you relate to the storylines more. Feel the irony in other people's laughter. Right off the bat I think that this show has a lot of potential. Melissa Peterman brings all her charm from "Reba" - plus some. The storylines are quirky and the characters are like you and me - the average working class family. A hit for sure. It reminded me a lot of the late 90's sitcom King of Queens. Which just goes to show that every sitcom needs a grouchy old man. I hope that Working Class hits the ground running. There's a conceivable hit here, but will they be able to compete with the network television big guns? I completed this review as part of my membership with the One2One Network. I was in no way compensated, and the opinions expressed are my own. I will be entered to win prizes for my posting.